One of the curious things that comes up a lot in the research into student learning outcomes as well as Positive Psychology is the power of goal-setting. Without oversimplifying it, we know that for a boy, where he ‘sets the bar’ is often where he will actually get to (results-wise). We also know that having clear steps and accountability are factors that can drive change and improvement. While this story may not be generalised to all students (as some are already working at capacity), it offers a couple of important lessons. First, as Daniel Pink – author of the international best-seller Drive: The Surprising Truth About What Motivates Us – tells us, the keys to motivation are: purpose, mastery and autonomy. (Here, autonomy correlates with choice.) Similarly, self-determination theory teaches us that boys are driven by relatedness, competency and, again, autonomy; having the ability to choose is vital. So, how do we tap into the idea of autonomy with boys? How do we get them to see more broadly and understand the impact of what is happening? The key is in assisting them to expand their thinking and to start to make connections between actions and reactions. As parents, we need to build in a time during the week to help them reflect and plan, and to see the bigger picture. Try this simple exercise at home with your son – it might help you both put things into better perspective. Periscopes are not only found on submarines! The purpose of a periscope is to look at something that is not in the direct line of sight. 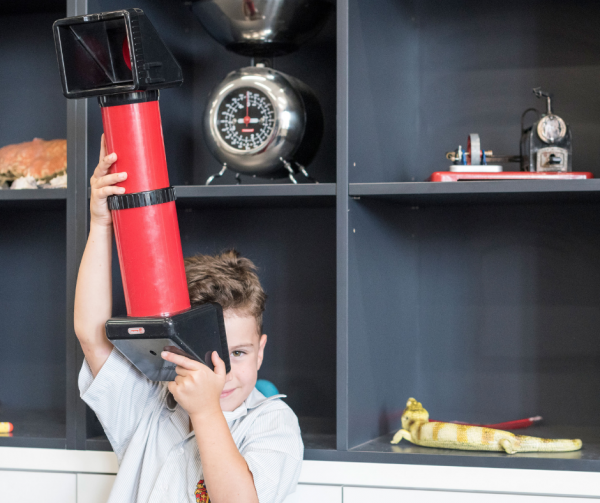 We can use the idea of a periscope to encourage boys to look beyond the immediately obvious. Step 1: Choose a time in the week (the same time each week, if possible) when you and your son can hold a conversation. Step 2: Review the previous week (use the periscope to look back). For example: How did the week go? Did you get to where you needed to be? For some boys, using an idea like ‘PMI’ (what were your pluses, minuses and interestings from the week) can work. The point is to start a conversation and listen. Step 3: Plan the next week (use the periscope to look ahead). The point of this is to gain a ‘heads up’ on the upcoming week. You might like to share your week, too: When are you home, or back late? When are the peaks and troughs? Are there things that you can do together to help iron out some of the more challenging times in the week? There is enormous power in having boys and young men choose. To assist in this process, we need to help them connect to the bigger picture.